In 2003, when I first met Lorraine Tarket-Arruda and discovered that she and Gayle Waite had published their first book, the scholarly “Hopkinton, Rhode Island Historical Cemeteries” nothing would do but to visit at least one of the 86 cemeteries recorded in their book. Road Projects Respect Tiny, Old Graveyards. 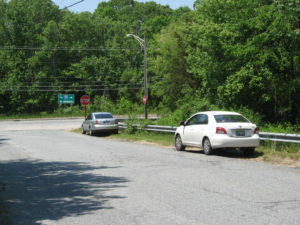 “An almost indiscernible plot of ground in Hopkinton, only about 25 feet by 15 feet in dimension, has been by-passed by the State Highway Department on two different occasions during the past 30 years as roads have pushed through the one-time open countryside. The plot of ground has been declared sacred due to three rough flat stones set up on edge to identify the small area as a graveyard. Thus the area has been duly respected by the state highway engineers who have drawn their plats for state roads with a recessed line at the spot, allowing the graveyard plot to remain undisturbed while heavy equipment has churned through the landscape to establish the heavily-traveled Nooseneck Hill Road (Today’s Route 3) The same plats have divided large farms and have on occasion split farm houses and other buildings in the course of establishing a right-of-way for the roads. 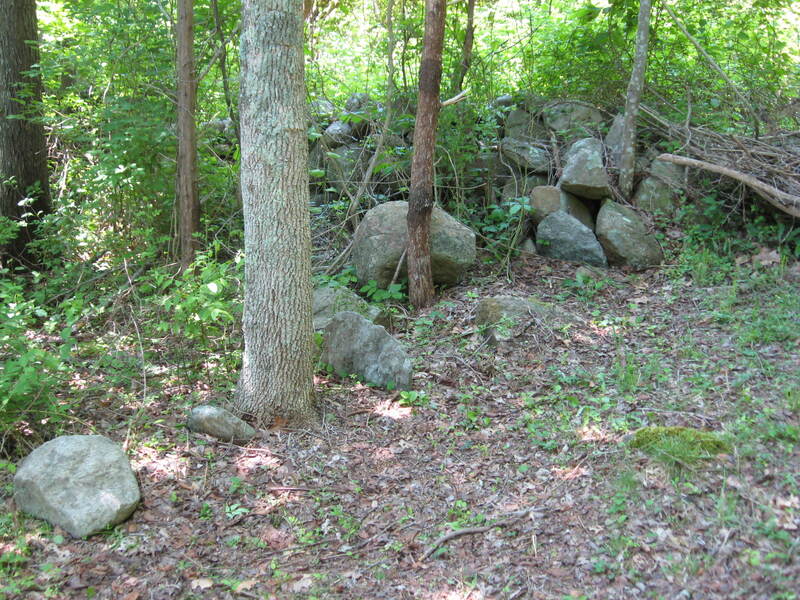 At least two of the stones, facing each other about six feet apart, have identified one grave, and another stone indicates that one more grave may have been dug at the spot many years ago near an old stone wall. But only the position of the crude stones identified the ground as a small graveyard. No markings appear on the stones and none of the older residents of Hopkinton have been able to shed any light as to who or how many persons may be buried there. A narrow strip of land on the northwest side of the Nooseneck Hill Road, where the graveyard is situated, is now owned by Mrs. Walter D. Kenyon of Hopkinton, who acquired the property from the Greene family early in the 1900’s Neither the Kenyon family nor members of the Greene family have been able identify the graves except to note that they are located at the particular spot. Lawrence D. Kenyon, son of Mrs. Kenyon and Hopkinton Town Clerk, said that the names may possibly be among the old Hopkinton town records at the Town Hall but that they would still have to be identified as to the graves. The first official identity found regarding the plot as a burial ground is on the state highway plats of 1923 when the Nooseneck Hill Road was first constructed through the open farm land. At that time The approximate 25 by 15 foot recess was allowed on the state property when it was purchased from the Kenyon family. This same recess is accounted for on the plats for the new construction this year which includes an overpass section, the south end of which ends near the graveyard site. This overpass section, which will take traffic to the Westerly area from the new four lane highway (Today’s Route 95) now under construction, was opened last week. Bulldozers and other equipment am now tearing up the old section of the road within a few feet of the unknown graves. Arthur Champlin, 72, of Ashaway, who was born and brought up in the Hopkinton vicinity said that he had never heard of the graveyard, although he had often “cut cross lots” through the area when he was a boy. A farmer in the vicinity, John Cole, 57, said he first heard of the grave or graves about 20 years ago when the first road went through, but that they were not identified at that time. Another native farmer, Edwin Ines, 48, has heard of the graves but he also could discover no identification. William Allen, state highway inspector on the current construction, at first believed the graves might have been established by Indians, but this theory was exploded when he was informed that Indians did not mark their graves. Several other “old timers” had no knowledge of the plot or had only heard stories that it existed. Old graveyards in the vicinity are not rare, incidentally, but most of them are identified with a particular family. 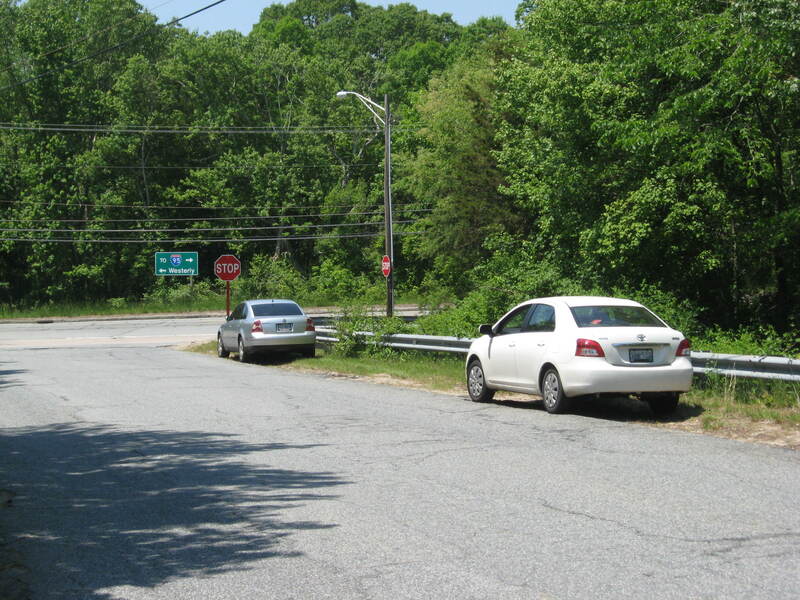 “Located 15 feet west of Route 3 at telephone pole #249. I clearly remember thinking that it would be easy to find this “Saved, but wounded cemetery”, and set off optimistically. I was wrong. I walked back and forth through poison ivy, bull briars and bugs and didn’t see anything except poison ivy, bull briars and bugs for a full half hour! This was my first time in Hopkinton’s be-wilderness, and my eye was tuned for Donuts, Pizza and Hardware Stores, in spite of my thinking I knew what I was doing in the woods. I was on my way out of this snag-tangle when I saw the concrete marker. I had to be inside the State Highway Marker Boundary. Moving a few feet towards the way out, I still saw no sign of any field stone grave markers. (I was yet to learn how elusive they can be for something so obvious to a trained eye.) Before I gave up completely, I took one last look at the small patch of ground at my feet. I was literally standing 8 inches away from what is now the most beautiful field stone of the hundreds I have since seen. I have learned a lot about seeing what is around me in the forest in the decade that has passed since my first encounter with Cemetery #67. I have checked in with Town Hall, (see Lauri), and have taken over the maintenance of this lovely place. I am certain that 95% of all readers of this posting “Drive By” this quiet spot often. This article is meant to show you what is resting in Peace behind that hole in the forest wall that flashes by your side window. This short walk, 100 feet for the round trip, will be to the most poignant cemetery I know. There are times when we have to work on our sense of mortal time, absorb what our eyes are telling us, and gradually let the experience shape our perspective. This cemetery had that effect on me, and I truly hope it has the same effect on you. We get in my truck, tan, the color of dust, and take Collins Road to Maxson Hill Road, turn right at the stop sign, then take the first left onto Frontier Road. We pull over in a safe spot, well before the junction with Route 3. Both of us are wearing boots, as we are going to be walking through poison ivy. We have no sticks, no water, no pack, no nothing, just our eyes and a heightened sense of anticipation that quickens our every move. This walk will take 10 minutes or less. Visiting an old cemetery, especially hidden from the beaten path, brings out a sense of history passing by, one person at a time. Our mortality, normally hidden silently within, confronts us face to face. Personally, I find it is not a scary feeling. I am never uncomfortable, in fact, just the opposite, I have a sense of friendship, kinship and loving interest for people I have never met. Standing beside a simple fieldstone marker brings an inescapable natural proportion to my life. We walk along the curving steel guardrail till we reach the wood post for the 40 MPH speed limit sign. Directly across Route 3 is the path we will walk, going straight into the woods, cut between two cedar trees. The apron of the road is mowed, but after that ten foot swath, it is mostly poison ivy. The cars and trucks roar past on the highway, some to join the flow of Interstate Route 95 from the ramps a few hundred yards to the North. Stepping lightly onto the thinnest growth, we walk exactly 39 feet in from the curb. Through the poison ivy and other growth, we spot a large rock just protruding above the ground in the exact center of the path. Ahead of us, there is a modern gap 6 in the wall feet away. To our left, a tree, probably an ash about 8 inches in diameter, is just a few feet away, so close we can reach out and touch the trunk. Looking down, it’s hard to grasp the significance of what our eyes tell us at first, and then it connects in our minds. Don’t be surprised at a failure to see it right away, even though you are only three feet from the burial. The footstone of this grave is quite shapely for an ordinary rock. It rises out from behind the tree, about a foot tall and fifteen inches wide. 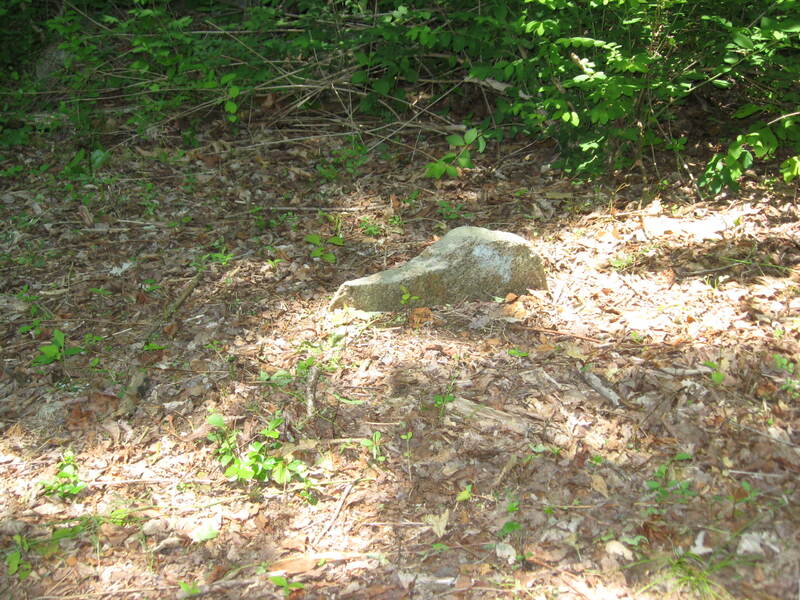 Sometimes “I Love You” takes the shape of a fieldstone grave marker. Just a few inches thick, it tapers delicately to less than an inch along the upper edge, as if it had been sculpted, but this is a natural stone. I wonder how many stones a grieving survivor handled before choosing this enduring testament to a life and a love. As we will see, no one knows who is buried here, but I like to think it was a woman, well loved by her husband, who chose her stone to speak of her beauty to those who would see. a tree growing near where a heart once beat. we no longer hear the traffic just 40 feet away. We are in the silence of Time. The stone has no name, no date. You cannot help but to stare at that plain old rock, so purposeful, yet so easy to overlook. No one alive today knows who is buried in the three remaining marked graves, for there are other graves around you besides this one. Soon you will see other markers, then wonder at the damage of the path. Figure 42: Soon you will see other markers, then wonder at the damage of the path. 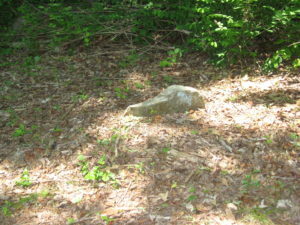 When you tune your eye to look for fieldstone markers, you will soon see the lady’s headstone at the base of the wall. There is a second headstone on the other side of the tree, with no apparent footstone. There is a third fieldstone to the right of where we are standing, also just a few feet from the path on the opposite side from the first grave. The thought will occur to you that maybe there were other graves and markers, but the making of this path and the wall gap destroyed their markers. It probably did. Others probably sleep beneath your feet. It was the custom that each family buried their dead. Those too poor to afford a carved headstone really didn’t need a written reminder as to who was buried where. This was family knowledge. A person grew up and had this personal history refreshed with each passing. Maybe you dug your parent’s graves with your own hands. Your children give you that same final respect and service. You knew exactly where every member of your family was, carved stone or no carved stone. How can we say with certainty which is a headstone and which is a foot stone? To answer this, we need to drop back in time to the Theology of that time. The early settlers came with a Christian belief in the literal Resurrection of the Dead. They believed that this Resurrection would sweep around the globe coming from the East. They interred those believed to be “Good” people along the East West axis. This was done so that when the dead heard the Biblical call to come out of the memorial tombs, they would sit up facing the East and the One doing the Resurrecting. In the Valley there are many burial grounds, and almost all the burials are on the East West axis. But there is one site with two burials on a North South axis. This was an obvious message during their era that the people interred on this little hill were not considered “Good People”. In the family cemetery, as your years advanced, you would form a good idea of where you would be interred, and who would be your neighbors as you slept in death awaiting the Resurrection. It was all “Family” here. But how could the residents of Hopkinton Historic Cemetery #67 become forgotten, and unknown? Here is one theory. We live along the Eastern coast, proud of our history, but possibly asleep in school when things like the exploration and settling of the western frontier wilderness of Kentucky or Ohio got mentioned. Or all those other places between here and Hollywood, like Wisconsin and Kansas and Indiana, that stupid geography stuff. People left here to go there for good a reason. As an experiment in Colonial Agriculture, mark out a square 3 feet to a side in your yard. (Kids, ask mom or dad first before proceeding to tear up the lawn!) Now dig that square out by hand with a shovel to a depth of 3 feet. You are removing one cubic yard of New England soil. As you dig, place every rock as big as a baseball or larger in a separate pile. When the hole is finished, (har, har, har!) you will find that the pile of rocks removed form a cone about eight feet tall, and will probably never fit back into the hole they came out of. This is a fool proof way you can tell you are back in New England if you ever get really lost. Now, with that experience fresh in mind, pretend you survive by manual/animal powered agriculture. Would you really stay here, busting one plow after another, making countless miles of rock walls but still toting an endless supply of rocks out of the ground every single year? Or would you move to the Ohio river valley where the top soil was soft loam 50 feet thick? People, especially farmers from the East, poured into the Ohio, Mississippi and other spacious river valleys of the Mid West and Great Plains in a migration that still has not ended after 2 centuries. So if little Willie and Josh go West, and Sally marries a city man from Providence, and Elias dies young, when poor old ma & pa go, the neighbor in the next farm has to bury them, and then he moves to Fort Dearborn, wayyyy out on the frontier, far away in the Michigan territory! And how quickly the forest reclaims it’s own. That could explain how this family cemetery passed beyond living memory. No man today can say who rests beneath the tree. there is no proof of this life that once was. Except now you know also! Part of the unique feeling of this special place is that each visitor who braves the poison ivy carries within themselves the knowledge that someone once drank life to the full, and finally ended up here, nameless, beneath the tree, but not totally forgotten, because now we know. Another part is the irony of the setting. The intensity of the initial encounter being over, we can now hear the traffic clearly, the whine of tires on Route 95, the wind from the cars on Route 3. Just forty feet away, traffic streams steadily past, bound for some pseudo-important event we are destined to forget in less than a week. Don’t you remember, we passed this very spot twice yesterday! It’s a cliché, but what would these people say was the thing they missed the most about living; zooming someplace, or holding hands with your sweetie. The valley has it’s own cemeteries, 14 of them that we know of. But I am of the opinion that you cannot absorb the fullness of Valley time and the Valley itself without first standing quietly right here, for a long moment, next to the Zoomings. Right here, touching this tree, beside these fieldstone grave markers. Markers that saved some ancestors from being erased. and out there on the road, the Now is zooming past us into the Future. The Future doesn’t care about this old place. Here, standing within the shaded graveyard, we watch the flash of colors as people drive past their end of the tunneled vision of the path. They move too fast for us to even be seen by them, and not one in a thousand knows what common destiny is waiting patiently, just off the road, behind twin cedars, covered in aptly named “Bittersweet Vines. keep your eyes open on our remaining walks through the heart of the valley. This valley has been preserved by chance, not design. The nameless people buried in “Hopkinton Cemetery # 67” had every reason to believe that time would be kind to their bones, but their family left them or died off. Once again, all that keeps the valley from being erased are the stones. One day, the stones will inevitably be pushed over by the future. Remember, please. Snow fell last night, two fluffy inches. I went out to see if I could spot the fieldstone against the white back drop. On my first try, a car was tailgating, and at 40 miles per hour, I couldn’t see it, I was too busy driving. On my next attempt, I had no one behind me, I dropped to thirty, and was rewarded by the dark tan rectangle of the stone, partially blocked by the tree. It was just for an instant, looking down the tunnel of the path, but it was calming. Drive safe, but it can be seen. The pictures in the slide show are all of Cemetery #67, taken May 31st, 2013, after my second clean up of this year. Follow your curiosity after thinking about this article, and come over for a visit and see the real thing for yourself. Park on Frontier Road, and be careful crossing Route 3. Please park responsibly, like the white car, not illegally, too close to the stop sign, like the gray car. You should still wear “closed toes” shoes, but now you have to really want to get poison ivy or encounter a bull briar, as they have been greatly reduced in clearing the forest floor. Plus, I guarantee you will find all 4 of the head / foot stones right away! And my friends will thank you for your thoughtfulness in remembering them. Names don’t matter when talking “heart to heart”. The History of Hopkinton did not begin in the 1660’s, during the European Colonial expansion. The Indigenous Peoples, predominantly of the Narragansett Tribe, had a long period of time, perhaps many millennia, to build up an extensive Oral History of the Life and Times of their lives, and their deaths, on this same area. The Narragansett wrote their history in Sacred Landscapes, the remains of some still visible in the forests. Much like the family grave yard I describe in the article “The ‘Drive By’ Cemetery”, they did not write a name on a rock as a memorial to one who’s life had ended. They knew, the family knew, and by extension, the Tribe knew who was buried in the earth of their land held in common, and who was honored by a Memorial stone, although fallen far from home. The forest they walked every day was their History Book. Their burials, as well as their sacred sites and effigies, surrounded them as they lived from birth to death. The Colonists brought their own burial traditions, customs which were also many millennia old. For the majority, their final resting place was marked with an ordinary rock, or, in the case of “The ‘Drive By’ Cemetery”, a rock made extra-ordinary by it’s use. Both cultures depended on Oral Tradition to recall to mind the individual placed into the earth. But as wealth accrued to the Europeans over the centuries, it became the practice to have stones engraved with the particulars of a person’s life. The European practice was to record these same particulars in the written paper records of the village or town, regardless of the wealth of the deceased. For examples of the detail with which the Town was involved in the lives of the individual, pick any of the genealogical records from 1757 – 1850 on this site and read any twenty consecutively. It is astonishing! Today, we would think the Town Council was meddling in our private lives, but back then, they viewed it as the Town Council was keeping order in Hopkinton. And in those annals of the day to day, accumulating year by year, are the particulars of those people’s birth, marriage and death. By the nature of this tradition of record keeping, there is far more accessible information available to write about these cemeteries and these lives, but HHA is about HISTORY, writ W-I-D-E, not narrow. HHA is actively involved with making this site available to Narragansett writers, as well as other Indigenous writers, to teach the “Community of Interest” that visits these pages about the oral history of their traditional ways. As I write this, I think of the symbolic and tangible commitment made by HHA to the Indigenous Narragansett, in that the very first Internet link to go up on our site is to the Tomaquag Memorial Indian Museum in Exeter. I hope we will have many articles over time, sharing what they wish to share with our readers. This is a simple thing, to open a door to a different world view, and ‘Open The Door To Learning’ is at the core of this site’s purpose, but we do not live in a simple world. If you approach this site with cast iron rigidity from any end of the spectrum of race or culture, of course we will be completely wrong, and only publishing garbage. But this site is for those seeking to know, even if it is only to widen out their own perspective, or to follow their own curiosity. And it may be that the common ground of respect for the dead may serve as the bridge to building respect for the living. And we are living together in Hopkinton, and hopefully sharing in the fullness of it’s history, our history. And we at HHA do not believe that exploring the full spectrum of our common history is in any way a waste of time, rather, it is a rare and valuable treasure. But enough of the “Big Picture”. Within the GENEALOGY PORTAL, The Cemeteries Pages work hand in hand with the “Births”, “Deaths” and “Genealogical” wings of this Sub-Section Library, in that all four are sources of “Certain Knowledge”, which is the bedrock for Historical Researchers and Genealogical Researchers. HHA is fortunate to have two members who literally wrote the book on Hopkinton’s Cemeteries, Gayle Waite and Lorraine Tarket-Arruda. In time, we hope they will contribute articles and Photo Tours of some of Hopkinton’s interesting cemeteries, the kind you can drive to, and the kind you need a compass to find. and that certainly does include you and your essay!